When our long-standing client Gondwana first approached Realm Digital with the desire to rebuild their website, we couldn’t wait to get our teeth stuck into this project. 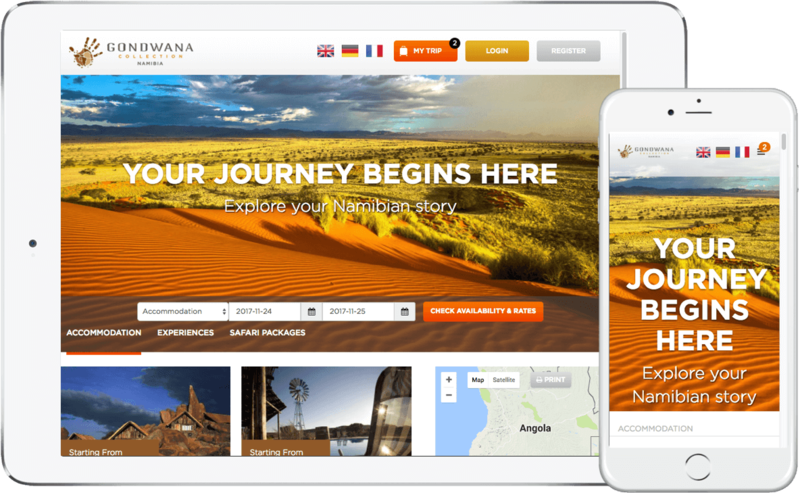 Gondwana wanted to create an all-in-one Namibian experience that would allow users to book multiple accommodations and plan their perfect trip on one website. The project required a complete redesign from our side, greatly influenced by the natural beauty of the Namibian landscape. Users are able to browse through award-winning imagery and explore these vivid landscapes through interactive video technology, that will surely draw the customer in and experience Namibia like never before. The website needed to initiate the Namibian experience right off the bat. 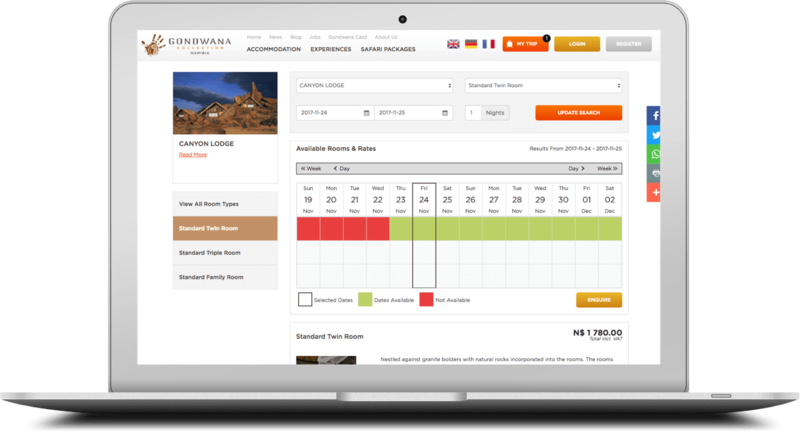 It needed to allow users the freedom to plan their ultimate Namibian holiday through the purchasing of accommodations and safari packages within a single session. 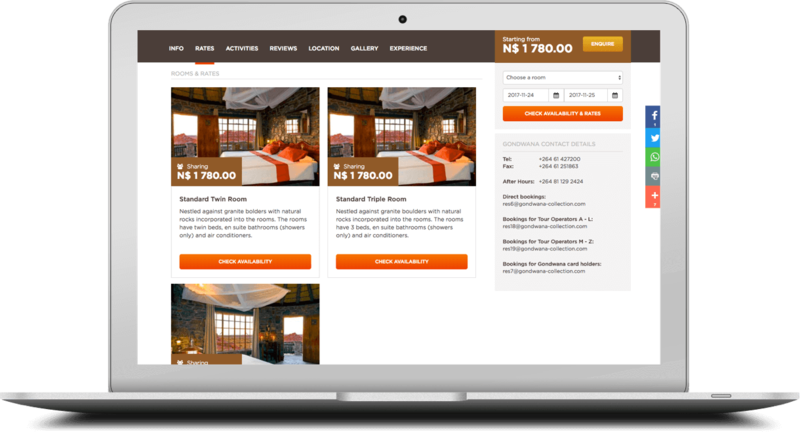 Innkeeper integration allowed the client to sync the availability of all 23 lodges around Namibia in one beautiful system, that serviced all their requirements and objectives brilliantly. 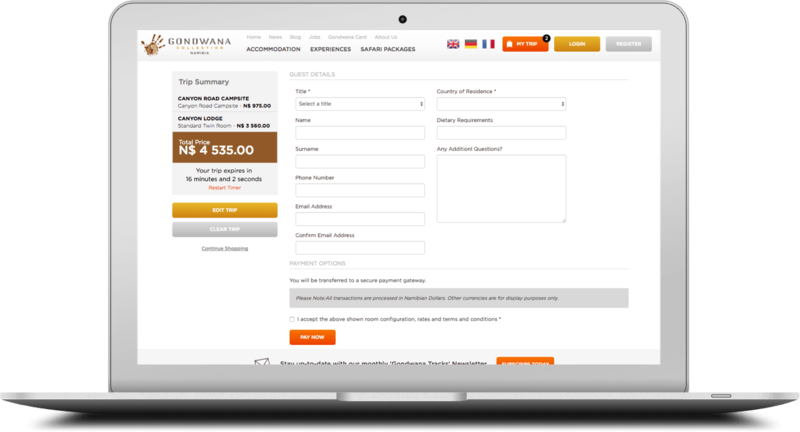 The Gondwana Collection is one of the first companies in the tourism sector to integrate the booking system and a custom built E-commerce shopping cart function seamlessly into a new fully adaptive and responsive website. It is compatible with any electronic device. An innovative piece of tech we were able to implement with this project was the integration to Google Maps. We used the maps API as well as distance matrix API to plot a user’s trip, enabling them to plan their itinerary, as well as calculate drive time between lodges, which makes for efficient planning. This project has enabled the Realm Digital team to implement more current technology including Angular, which was used to build the front-end, which in turn upskilled a few of our team members. We were also able to devise a more efficient deployment strategy for releases. I thoroughly enjoyed working on this project and enjoyed my trip to Namibia. Dealing with all the relevant stakeholders has been pleasant. 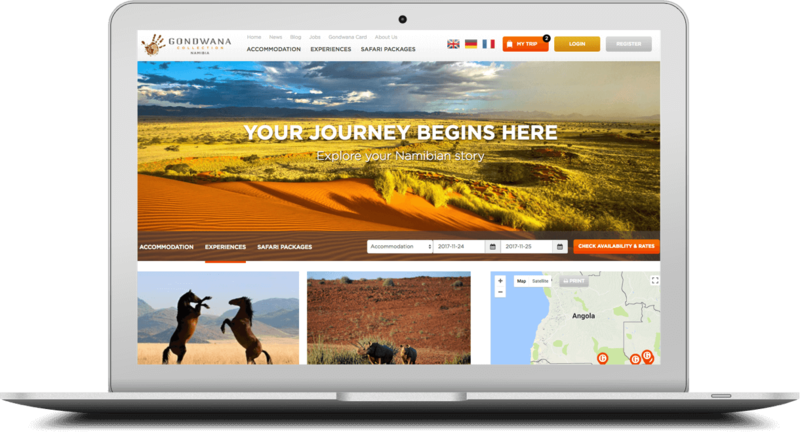 I’m certain that this new website will aid Gondwana’s vision to build a Namibian travel community. It was an absolute pleasure working with Realm Digital on this e-commerce project. Thank you very much for your input, effort and understanding throughout the last 20 months! 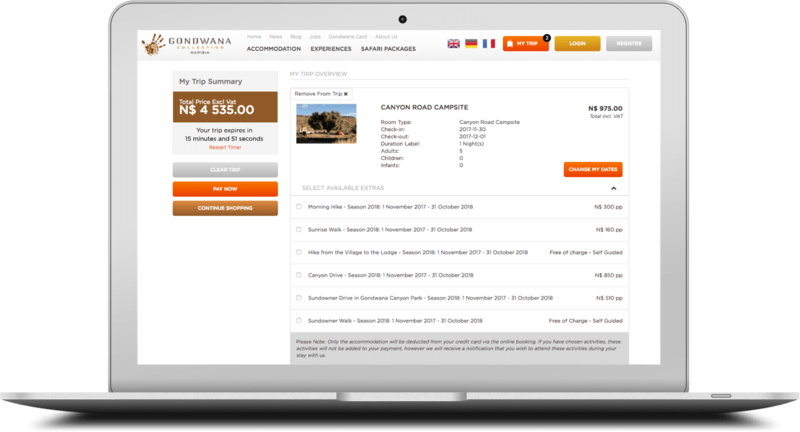 Users can now plan their entire Namibian holiday from the comfort of their home, knowing that all routes have been mapped out through the integration of the Google Distance Matrix API, which allows the client to select the optimal drive time between properties, or to recommend another Gondwana accommodation along the route.